Politisches Journal nebst Anzeige von gelehrten und andern Sachen [Politisches Journal nebst einem gelehrten Anzeiger]. Jahrgänge 1(1781) bis 14(1794) gebunden in 28 Bänden (je Jahrgang 2 Teilbände mit zus. zwölf Monats-Stücken). LAWS ENACTED IN THE SIXTH GENERAL ASSEMBLY OF THE REPRESENTATIVES OF THE FREEMEN OF THE COMMONWEALTH OF PENNSYLVANIA, AT THE SITTING WHICH COMMENCED AT PHILADELPHIA ON MONDAY THE TWENTY-SECOND DAY OF OCTOBER, AND CONTINUED BY ADJOURNMENTS TO FRIDAY, THE TWENTY-EIGHTH DAY OF DECEMBER, . Philadelphia: Hall and Sellers. 1782. Folio. 8pp, as issued. 'Vol. II' printed on title page. Evans 17659. NAIP w007067 . [bound with] LAWS ENACTED IN THE SECOND SITTING OF THE SIXTH GENERAL ASSEMBLY OF THE COMMONWEALTH OF PENNSYLVANIA WHICH COMMENCED AT PHILADELPHIA, ON MONDAY, THE ELEVENTH DAY OF FEBRUARY, . [Philadelphia: Hall and Sellers. 1782]. Folio, caption title [as issued]. Pages -81, [2- Table of Acts], [1 blank] pp. Evans 17660. NAIP w023483 . [bound with] LAWS ENACTED IN THE THIRD SITTING OF THE SIXTH GENERAL ASSEMBLY OF THE COMMONWEALTH OF PENNSYLVANIA WHICH COMMENCED AT PHILADELPHIA, ON THURSDAY, THE FIRST DAY OF AUGUST, . [Philadelphia: Hall and Sellers. 1782]. Folio, caption title [as issued]. Pages -110, [1- Table of Acts], [1 blank] pp. Evans 17661. NAIP w023484 . [bound with] LAWS ENACTED IN THE SEVENTH GENERAL ASSEMBLY OF THE REPRESENTATIVES OF THE FREEMEN OF THE COMMONWEALTH OF PENNSYLVANIA, WHICH COMMENCED AT PHILADELPHIA, ON MONDAY, THE TWENTY-EIGHTH DAY OF OCTOBER, . Philadelphia: Hall and Sellers. 1782. Folio. , 116-126 pp, as issued. Evans 17662. NAIP w023485 . [bound with] LAWS ENACTED IN THE SECOND SITTING OF THE SEVENTH GENERAL ASSEMBLY OF THE COMMONWEALTH OF PENNSYLVANIA, WHICH COMMENCED AT PHILADELPHIA, ON WEDNESDAY, THE FIFTEENTH DAY OF JANUARY, . [Philadelphia: Hall and Sellers. 1783]. Folio. , 128-183, [1 blank] pp. Caption title, as issued. Our copy paginates '184' correctly. Evans 18094. NAIP w023486 . [bound with] LAWS ENACTED IN THE THIRD SITTING OF THE SEVENTH GENERAL ASSEMBLY OF THE COMMONWEALTH OF PENNSYLVANIA, WHICH COMMENCED AT PHILADELPHIA, ON THURSDAY, THE FOURTEENTH DAY OF AUGUST, . [Philadelphia: Hall and Sellers. 1783]. Folio. -254, [2- Table of Acts] pp. Caption title, as issued. Two rubberstamps on margin of title page. Evans 18095. NAIP w023487 . [bound with] LAWS ENACTED IN THE FIRST SITTING OF THE EIGHTH GENERAL ASSEMBLY, OF THE COMMONWEALTH OF PENNSYLVANIA, WHICH COMMENCED AT PHILADELPHIA, ON MONDAY, THE TWENTY-SEVENTH DAY OF OCTOBER, . [Philadelphia: Thomas Bradford. 1783]. Folio. -270, [1- Table of Acts], [1 blank] pp. Caption title, as issued. Evans 18096. NAIP w023488 . [bound with] LAWS ENACTED IN THE SECOND SITTING OF THE EIGHTH GENERAL ASSEMBLY, OF THE COMMONWEALTH OF PENNSYLVANIA, WHICH COMMENCED AT PHILADELPHIA, ON TUESDAY THE THIRTEENTH DAY OF JANUARY, . [Philadelphia: Thomas Bradford. 1784]. Folio. -368 [i.e., 369, with pagination of page 362 repeated], [1 blank], iii, [1 blank] pp. Caption title, as issued. Evans 18681. NAIP w023489 . [bound with] LAWS ENACTED IN THE THIRD SITTING OF THE EIGHTH GENERAL ASSEMBLY, OF THE COMMONWEALTH OF PENNSYLVANIA, WHICH COMMENCED AT PHILADELPHIA, ON TUESDAY THE TWENTIETH DAY OF JULY, . [Philadelphia: Thomas Bradford. 1784]. Folio. -399, [1 blank], ii pp. Caption title, as issued. Evans 18682. NAIP w023550 . [bound with] LAWS ENACTED IN THE FIRST SITTING OF THE NINTH GENERAL ASSEMBLY, OF THE COMMONWEALTH OF PENNSYLVANIA, WHICH COMMENCED AT PHILADELPHIA, ON THE TWENTY-FIFTH DAY OF OCTOBER, . Folio. -415,  pp. Caption title as issued. Evans 18683. NAIP w020616 . [bound with] LAWS ENACTED IN THE SECOND SITTING OF THE NINTH GENERAL ASSEMBLY, OF THE COMMONWEALTH OF PENNSYLVANIA, WHICH COMMENCED AT PHILADELPHIA, ON THE FIRST DAY OF FEBRUARY, . Folio. -587, [1 blank] pp. Caption title as issued, lacking the Table of Acts at the end [iv pp]. Evans 19160. NAIP w020618 . [bound with] LAWS ENACTED IN THE THIRD SITTING OF THE NINTH GENERAL ASSEMBLY, OF THE COMMONWEALTH OF PENNSYLVANIA, WHICH COMMENCED AT PHILADELPHIA, ON TUESDAY THE TWENTY-THIRD DAY OF AUGUST, . [Philadelphia: Bradford. 1785]. Folio. -704 pp. Caption title as issued. Lacking the Table of Acts at the end [iii pp]. Evans 19161. NAIP w023490 . [offered with] LAWS ENACTED IN THE FIRST SITTING OF THE TENTH GENERAL ASSEMBLY, OF THE COMMONWEALTH OF PENNSYLVANIA, WHICH COMMENCED AT PHILADELPHIA, ON MONDAY THE TWENTY-FOURTH DAY OF OCTOBER, . [Philadelphia: Thomas Bradford. 1785]. 8, , [1 blank] pp. Folio. Caption title, as issued. Light rubberstamps to title page. With material on "the disturbances at Wyoming." Evans 19885. NAIP w020617 . [bound with] LAWS ENACTED IN THE SECOND SITTING OF THE TENTH GENERAL ASSEMBLY OF THE COMMONWEALTH OF PENNSYLVANIA, WHICH COMMENCED AT PHILADELPHIA, ON THE TWENTY-FIRST DAY OF FEBRUARY . [Philadelphia: Thomas Bradford. 1786]. Folio. Caption title, as issued. -87, [1 blank], 4 pp. Evans 19886. NAIP w020619 . [bound with] LAWS ENACTED IN THE THIRD SITTING OF THE TENTH GENERAL ASSEMBLY OF THE COMMONWEALTH OF PENNSYLVANIA, WHICH COMMENCED AT PHILADELPHIA, ON THE TWENTY-SECOND DAY OF AUGUST, . [Philadelphia: Thomas Bradford. 1786]. Folio, caption title as issued. -179, [1 blank], 3, [1 blank] pp. Evans 19887. NAIP w023491 . [bound with] LAWS ENACTED IN THE FIRST SITTING OF THE ELEVENTH GENERAL ASSEMBLY OF THE COMMONWEALTH OF PENNSYLVANIA, WHICH COMMENCED AT PHILADELPHIA, ON THE TWENTY-THIRD DAY OF OCTOBER, . [Philadelphia: Thomas Bradford. 1786]. Folio, caption title as issued. -194, , [1 blank] pp. Evans 20626. NAIP w020615 . [bound with] LAWS ENACTED IN THE SECOND SITTING OF THE ELEVENTH GENERAL ASSEMBLY OF THE COMMONWEALTH OF PENNSYLVANIA, WHICH COMMENCED AT PHILADELPHIA, ON THE TWENTIETH DAY OF FEBRUARY . [Philadelphia: Thomas Bradford. 1786]. Folio, caption title as issued. -313, [1 blank], iv pp. Evans 20627. NAIP w023492 . [bound with] LAWS ENACTED IN THE THIRD SITTING OF THE ELEVENTH GENERAL ASSEMBLY OF THE COMMONWEALTH OF PENNSYLVANIA, WHICH COMMENCED AT PHILADELPHIA, ON THE FOURTH DAY OF SEPTEMBER . [Philadelphia: Thomas Bradford. 1787]. Folio, caption title as issued. -400,  pp. Evans 20627. NAIP w023492 . [bound with] LAWS ENACTED IN THE FIRST SITTING OF THE TWELFTH GENERAL ASSEMBLY OF THE COMMONWEALTH OF PENNSYLVANIA, WHICH COMMENCED AT PHILADELPHIA, ON THE TWENTY-SECOND DAY OF OCTOBER . [Philadelphia: Thomas Bradford. 1787]. Folio. Caption title, as issued. -404, , [1 blank] pp. Evans 20629. NAIP w023494 . [bound with] LAWS ENACTED IN THE SECOND SITTING OF THE TWELFTH GENERAL ASSEMBLY OF THE COMMONWEALTH OF PENNSYLVANIA, WHICH COMMENCED AT PHILADELPHIA, ON TUESDAY, THE NINETEENTH DAY OF FEBRUARY  [i.e., 1788]. [Philadelphia: Thomas Bradford. 1788]. Folio. Caption title, as issued. -454,  pp. Evans 21366. NAIP w023495 . [bound with] LAWS ENACTED IN THE THIRD SITTING OF THE TWELFTH GENERAL ASSEMBLY OF THE COMMONWEALTH OF PENNSYLVANIA, WHICH COMMENCED AT PHILADELPHIA, ON TUESDAY, THE SECOND DAY OF SEPTEMBER . [Philadelphia: Thomas Bradford. 1788]. Folio. Caption title, as issued. -537, [1 blank],  pp. Evans 21367. NAIP w023496 . [offered with] LAWS ENACTED IN THE FIRST SITTING OF THE THIRTEENTH GENERAL ASSEMBLY OF THE COMMONWEALTH OF PENNSYLVANIA, WHICH COMMENCED AT PHILADELPHIA, ON MONDAY, THE TWENTY-SEVENTH DAY OF OCTOBER . [Philadelphia: Thomas Bradford. 1788]. Folio. Caption title, as issued. 7,  pp. Evans 21368. NAIP w023497 . [bound with] LAWS OF THE THIRTEENTH GENERAL ASSEMBLY OF THE COMMONWEALTH OF PENNSYLVANIA, ENACTED IN THE SECOND SITTING, WHICH COMMENCED AT PHILADELPHIA, ON TUESDAY, THE THIRD DAY OF FEBRUARY, . [Philadelphia: Thomas Bradford. 1789]. Folio, caption title as issued. -103, [1 blank],  pp. The final four pages are misnumbered, as issued. Evans 22054. NAIP w023498 . [bound with] LAWS OF THE THIRTEENTH GENERAL ASSEMBLY OF THE COMMONWEALTH OF PENNSYLVANIA, ENACTED IN THE THIRD SITTING, WHICH COMMENCED AT PHILADELPHIA, ON TUESDAY, THE EIGHTEENTH DAY OF AUGUST, . [Philadelphia: Thomas Bradford. 1789]. Folio, caption title as issued. -203, [1 blank], 3, [1 blank] pp. Evans 22055. NAIP w023499 . [bound with] LAWS OF THE FOURTEENTH GENERAL ASSEMBLY OF THE COMMONWEALTH OF PENNSYLVANIA, ENACTED IN THE FIRST SITTING, WHICH COMMENCED AT PHILADELPHIA, ON MONDAY, THE TWENTY SIXTH DAY OF OCTOBER, . [Philadelphia: Thomas Bradford. 1789]. Folio, caption title as issued. -232. Lacking the one-page table of Acts, which is provided in facsimile. Evans 22762. NAIP w023500 . [offered with] LAWS OF THE FOURTEENTH GENERAL ASSEMBLY OF THE COMMONWEALTH OF PENNSYLVANIA, ENACTED IN THE SECOND SITTING, WHICH COMMENCED AT PHILADELPHIA, ON TUESDAY, THE SECOND DAY OF FEBRUARY, . [Philadelphia: Thomas Bradford. 1790]. Folio, caption title as issued. -317, [1 blank] pp. Evans 22763. NAIP w023501 . A scarce, complete run of the Session Laws of Pennsylvania, from the late Revolutionary period through April 1790. 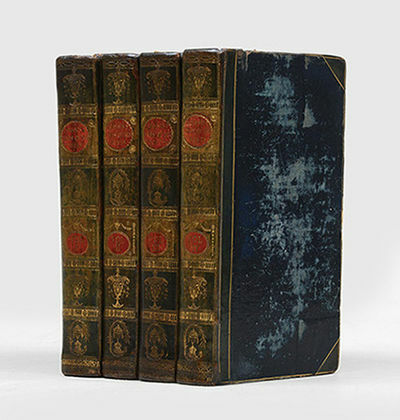 The four folio volumes in which they appear are bound uniformly in later cloth, with gilt-lettered morocco spine labels. Occasional rubberstamps, widely scattered foxing. Very Good. The Laws treat the exciting topics of Revolution and post-Revolution; relations with the federal Congress, other States, Indians; and a variety of other subjects under the Articles of Confederation and the early Constitution. London: Printed for the Author, 1781. First Edition. 8vo., 224 pages; G; 3/4 bound with red leather, marbled boards; spine paneled with gilt lettering; re-backed, with red cloth, new endpapers, previous spine largely preserved, with large chip missing on tail, small chip on spine; thinness to fore edge of paper, presumably from frequent use, title page through page 40 have some damage to the fore edge, larger damage to the title page and dedication pages, pages 189-224 have some damage to the fore edge, ; mild staining and age-toning throughout; title page has some faded ink writing on top of page, small bookworm holes; bookworm damage to pages 218-224; black stain on lower fore corner throughout, most severe on pages 206-224; first page of dedication hs a closed tear horizontal along the whole page; RG consignment; shelved case 9. Dupont. 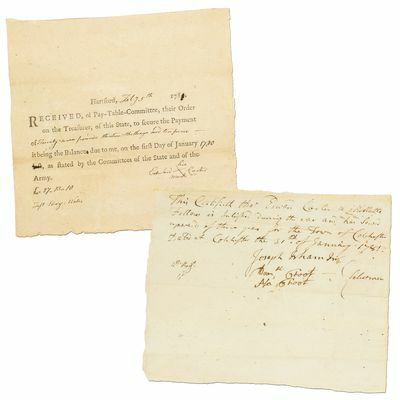 February 15, 1781. 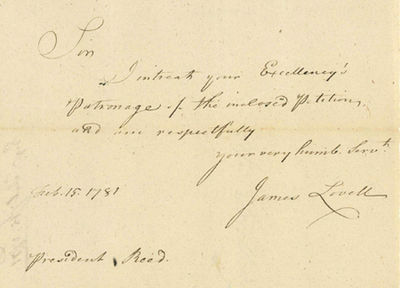 An autograph letter signed <I>"James Lovell"</I> as a Continental Congressman to <I>"President Reed"</I>. Lovell penned: <I>"I intreat your Excellency's Patronage of the inclosed petition... "</I> Written eight months before Cornwallis surrendered at Yorktown, Lovell wrote to Joseph Reed, the President of the Supreme Executive Council of Pennsylvania. The piece has wear along one margin that affects nothing; the paper is in fine condition with dark writing. Società tipografica. Sette volumi in 4to (cm 24); mezza pelle posteriore, dorso con fregi, tassello e titolo in oro, tagli marmorizzati (spellature e abrasioni varie); pp. XXVI, (2), 501, (3, di cui 2 bianche) + (4), 424 + (4), 452 + (4), 476 + (4), 451, (1) + IV, 343, (1 bianca) + pp. (2), 343-615, (1 bianca). Tra le pp. 238-39 del sesto volume si trova una grande tabella ripiegata fuori testo (Genealogia della Famiglia Allegri di Correggio). Capilettera ornati su rame. Vari indici ad ogni volume. Lievi arrossature e bruniture sparse, qualche fascicolo un po' sciolto, antichi timbri sui titoli, ma nel complesso buona copia postillata da mano coeva.EDIZIONE ORIGINALE della prima bio-bibliografia di scrittori del ducato estense, che all'epoca si estendeva fino alla Garfagnana e all'attuale provincia di Massa e Carrara. Il sesto volume di Supplemento contiene anche le Notizie de' pittori, scultori, incisori e architetti natii degli Stati del Serenissimo Signor Duca di Modena con una appendice de' professori di musica (pp. 213-343).Il Tiraboschi, originario di Bergamo, prosecutore della grande tradizione storiografica muratoriana, gesuita dal 1746, fu chiamato a Modena nel 1770 con l'incarico di dirigere la Biblioteca Estense. Nella citta' emiliana rimase per tutta la vita, attendendo a studi ancora oggi consultabili con profitto per la sterminata dottrina che vi e' profusa e per il rigore del metodo. Tra questi ricordiamo soprattutto la Storia della letteratura italiana (1772-1781). Dal 1773 al '90 fu prima collaboratore e poi direttore del Nuovo giornale dei letterati d'Italia (cfr. C. Frati, Dizionario bio-bibliografico dei bibliotecari e bibliofili italiani, Firenze, 1933, pp. 534-541).Brunet, V, 864; Lozzi, 2828; Th. Bestermann, A World Bibliography of Bibliographies, Totowa, NJ, 1971, 2641; A. de Backer-Ch. Sommervogel, Bibliotheque de la Compagnie de Jesus, Liege, 1898, VIII, col. 40, nr. 11..
London: Printed for the Author; and Sold by J. Bew, 1781. x, 2, 1*-2*, 3-436 pp [as issued]. Contemporary half sheep with marbled boards [some spotting, corners rubbed, spinehead lightly chipped], gilt-lettered spine label [small corner chip to label]. Glue remnant on front pastedown, foxed endpapers. Clean text with widely scattered foxing and occasional dusted outer margins. Very Good. Reverend Peters was a Loyalist Episcopal minister in Hebron, Connecticut. "He made himself so obnoxious by his prominence and activity as such, that he was presented with a coat of tar and feathers and permitted to visit England for his health." [Church]. "Mobbed in Connecticut for his Tory activities, Peters fled to England and, in retaliation, wrote this false and vicious misrepresentation of that commonwealth. Included were the Blue laws of the New Haven colony, manufactured by his animosity, but still swallowed as true by many people." [Howes]. His prefatory remarks, which purport to be "unbiassed by partiality or prejudice," charge Nutmeggers with "sinister views and purposes" and cast doubt on their "right to the soil they occupied." 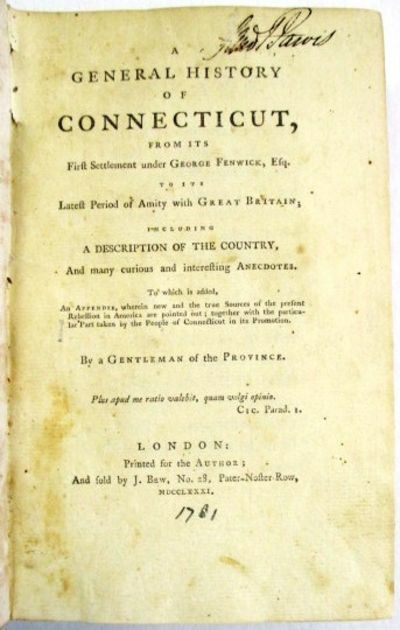 He charges them with "wanton and barbarous persecutions, illegal practices, daring usurpations, &c. &c." "His apocryphal history of Connecticut is a remarkable tissue of misstatements and exaggerations, not to say of malicious falsehoods." [Church]. "The first edition is very rare." [Sabin]. FIRST EDITION. Howes P262 'b'. Church 1183. Sabin 61209. 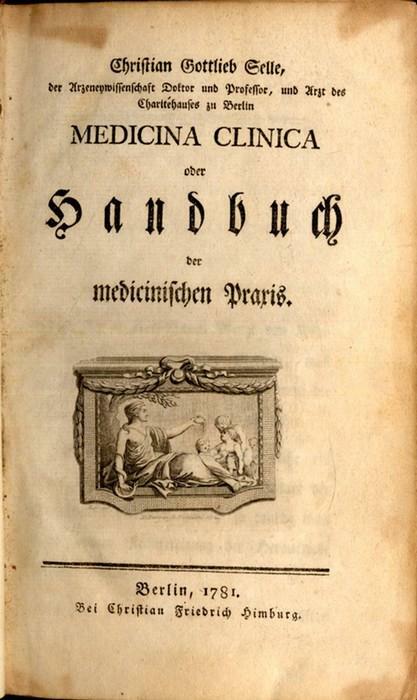 Medicina Clinica, oder Handbuch der medicinischen Praxis. folio, drophead and docket titles, (4)pp., with two short marginal tears (no loss and nowhere near printed surface), well bound in early 20th century cloth boards, spine lettered in gilt, with the old bookplate on front pastedown of Los Angeles Board of Law library (but no other marks of this previous ownership). 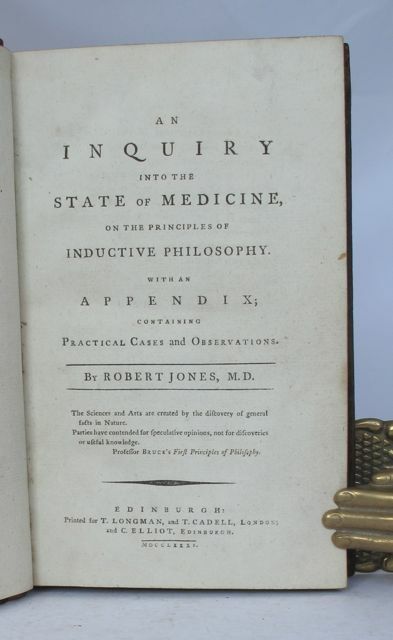 A very good copy.Publisher: [London,Year: 1781? ]Edition: Only edition. London: for Lockyer Davis, 1781. First edition. 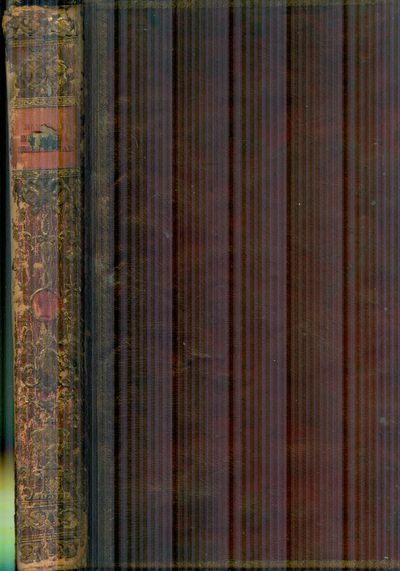 8vo, bound in period full tree calf with gilt ruled flat bands on the spine and a single red morocco label gilt ruled and lettered. xvi, 181, [2 ads] pp. A very nice and well preserved copy indeed, the text especially fresh and clean, the binding solid and firm with strong hinges and joints and only some expected rubbing or edge wear to the old calf. This is the first, unauthorized edition. Apparently the translator procured a copy of the unpublished manuscript from Raynal and without his knowledge or consent had simultaneous English and French editions published. The work was "intended to supplement the author's earlier history of European trade in the two Indies" (Howes). "States in brief form the leading facts from 1763 to 1778. Discusses, after the manner of the time, the claims of both parties. Interesting from its point of view" (Larned). Parma: Deux Ponts [i.e. Parma, Giambattista Bodoni], 1781. First Edition. Hardcover. Very Good. 16 volume set. Octavos, 21 x 14 cm. Bound in contemporary calf. Handsome bindings and covers. Gilt tooling to spines. All edges red. Marbled end pages. Clean, unmarked pages. 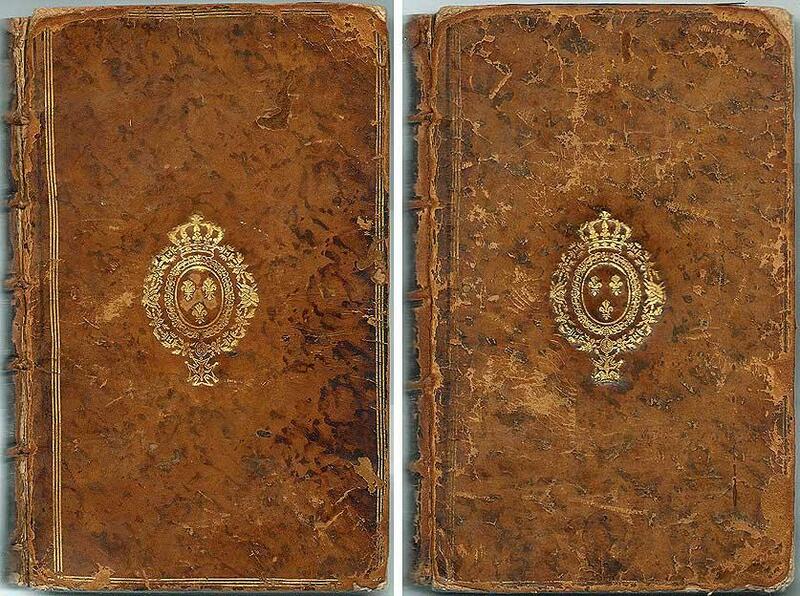 "Condillac's educational volumes designed for Ferdinando (1751-1802) who became duke of Parma in 1765." - Sotheby's 2011. Duke Ferdinand's reign was marked with Parma's conquest by Napoleon. He became Duke at age 14 after the unexpected death of his father. He was to be the last reigning Bourbon Dukes of Parma. 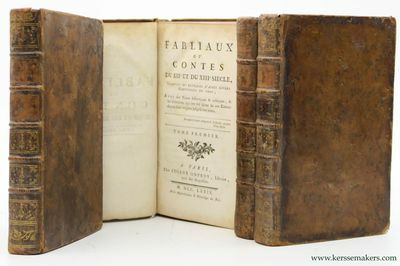 <br> The first edition was supposed to have been printed in 1775, but due to opposition from the Spanish monarchy, its publishing was delayed until 1782 when Bodoni was granted permission after changing the title page with the false location of "Aux Deux-Ponts". Thus, this is the first edition. Brooks 203. Tchemerzine, II, 481. This is an oversized or heavy book, which requires additional postage for international delivery outside the US. chez Yves Gravier, 1781. Cm. 19, pp. (2) 142 (2). Con grande stemma al frontespizio e 20 tavole f.t. (di cui molte ripiegate) tra cui la carta topografica più volte ripiegata (cm. 42 x 31 più margini). Il tutto nitidamente inciso in rame. Solida ed elegante legatura coeva in piena pelle, dorso a nervi con titoli e ricchi fregi in oro. Tagli rossi. Esemplare genuino e ben conservato, senza difetti. Edizione di molto ampliata rispetto all'originale del 1768 che possedeva solo 3 tavole. Celebre guida d'interesse genovese, a proposito della quale Schlosser (p. 552) così si esprime: "La superba e ricca Genova... in cui l'arte era da tempo immemorabile una cosa di lusso e d'importazione, a differenza della sua rivale Venezia, possiede nell'età antica solo la guida piuttosto tarda del suo storiografo Giuseppe Ratti... che vuole appunto colmare questa lacuna". La paternità dell'opera viene attribuita a G.A. Brusco ma per taluni sarebbe invece del Ratti. Fragmens d?un poéme moral sur Dieu. Ad majorem gloriam virtutis. Paris, 1781. 1st edition (Ronalds Catalogue, p. 475). 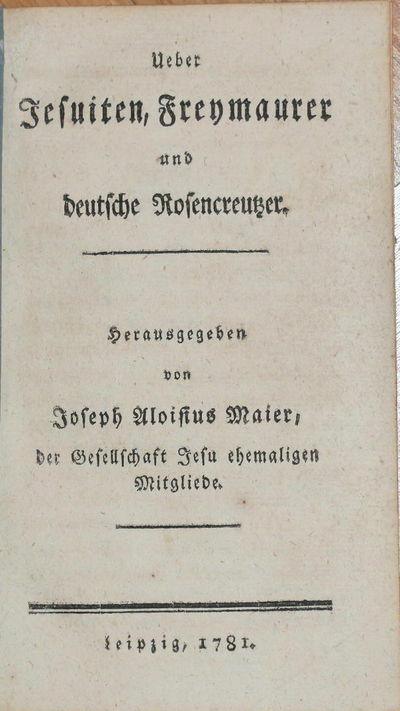 Mottelay records the publication of this work in 1785 (the implication being it's the title's first publication, though 1785 is the year of the 2nd edition). 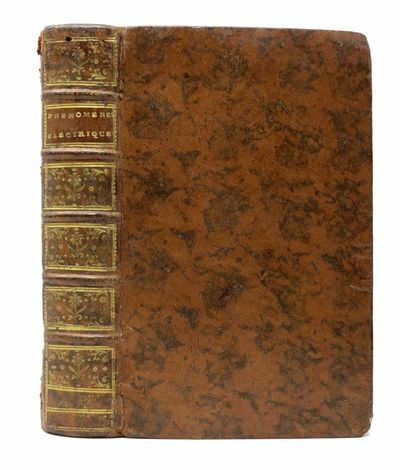 Bound in a period full leather of speckled calf, with elaborate gilt decorated spine. Edges stained red. Marbled eps. Bit of splay to boards. Tips show some wear. Joints starting @ ends. Withal, a VG copy.. xvi, 742,  pp. Printed glosses. Illustrated with 9 folding copperplate engravings, depicting the divers pieces of electrical apparatus of the day (bound, at rear, out of sequence). Head- tailpieces. 8vo: a8 A - 2Z8 3A4. 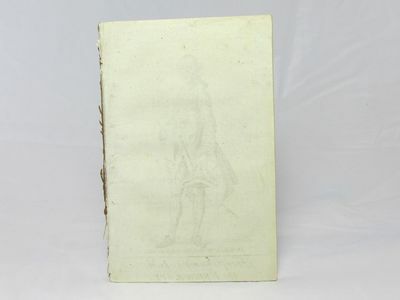 8" x 5" The author,while studying for his medical degree, attended a course of public lectures given by Abbe Nollet, the tenor of which so inspired Siguad's subsequent interest in, and investigations of, experimental science at the College Louis-le-Grand. In 1760, Siguad succeeded the Abbe Nollet in his chair at Louis-le-Grand, where, along with anatomy & physiology, he continued "those courses in experimental physics that had been taught by his famous predecessor." Siguad's "positive contributions to science were in the area of experimental technique. He is sometimes attributed with the invention of the glass insulator and the circular glass plate (to replace the glass globe) in electrical machines." 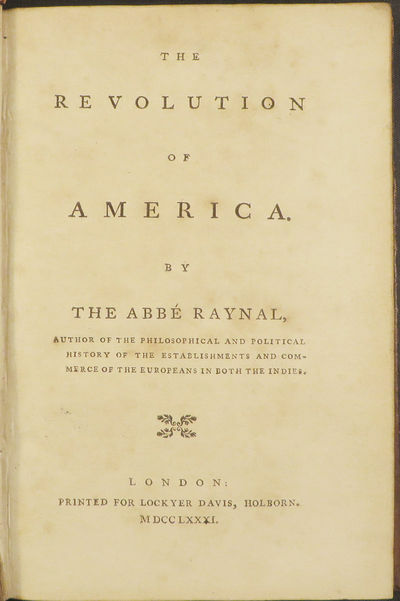 This particular work written by him slanted more toward the "enlightened layman", rather than offering a rigorous technical treatise for his peers, nevertheless it does provide a significant historical summary on the subject of Electricity, as well as current thoughts of the 18th Century. [DSB]. Valentia Edetanorum: Benedict Monfort , 1781. Latin text. Full title:" Archidiaconi Valentini Ser. Hisp. Infantum Caroli III Regis Filiorum Institutoris Primarii de Numis Hebraeo-Samaritanis" . BOOKPLATE of Monsenhor Ferreira ( Joaquim José Ferreira Gordo 1758-1838 ) Monsignor of the Holy Patriarchal Church of Lisbon, Lisbon Public Librarian, member of the Lisbon Royal Academy of Sciences .1781. Folio. Very Good in contemporary red morocco, embossed gilt spine decorations, gilt floral bordering, edge rubbing, modest wear to spine tips, cover spotting, spine label mostly absent. 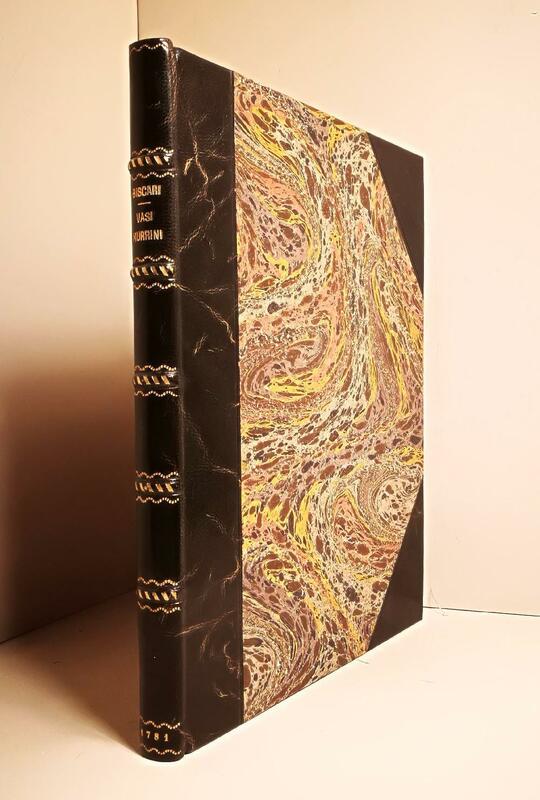 Aeg, marbled endpapers, patterened green ribbon tie, inner gilt dentelles. Frontispiece of Carlos III engraved by Ballester after Rafael Ximeno's drawing. 10 plates, vignettes. All pages and plates fresh and clean and unfoxed. Francisco Pérez Bayer (1711-1794) Spanish philologist, jurist and writer. Index, 245p (p). 1st Edition. Hardcover. Very Good. Opere... Giusta le correzioni e aggiunte dell'Autore nell'edizione di Parigi del 1780. Paris, 1781. Fine. Folio. 12 laid paper leaves hand stitched, paper spine. Title in manuscript on the first leaf, followed by 21 manuscript pages (foliated 1, 2, 2, 3 -- 10). 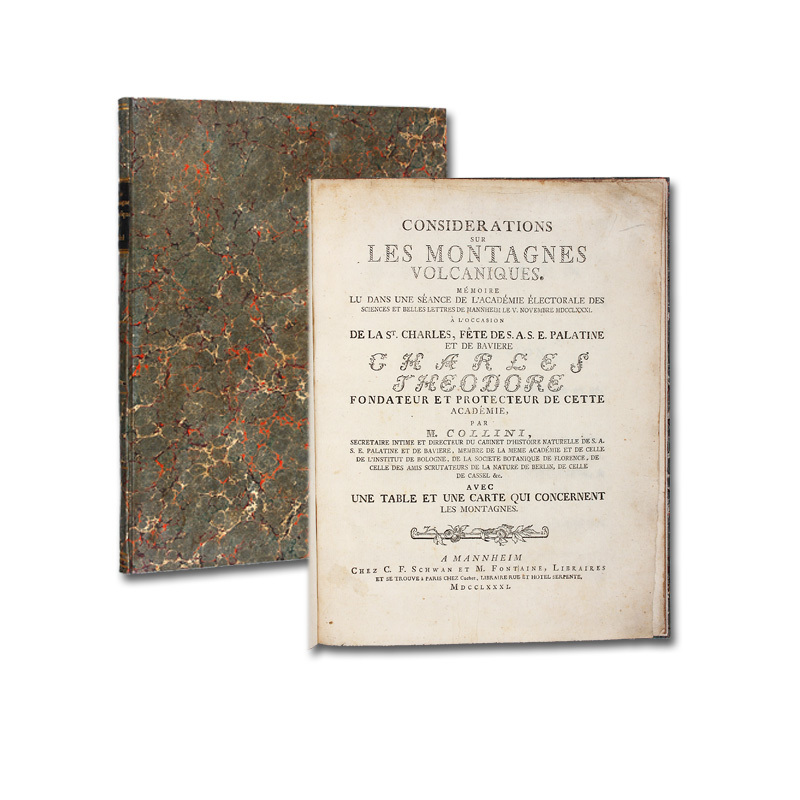 In fine condition with light rubbing to the edges of the first leaf, housed in a period-style quarter leather and cloth box with gilt-stamped rounded-spine and inner chemise. An original manuscript of this celebrated attack on French Finance Minister Jacques Necker, arguably the most powerful man in France before the Revolution. 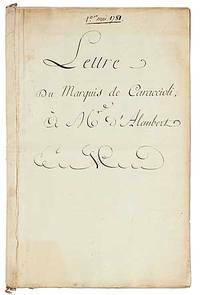 Written surreptitiously by Philippe Henri de Grimoard, an important military officer and trusted counselor to Louis XVI, the letter was published in the guise of an open letter between two prominent intellectuals: from the anti-Enlightenment writer Louis-Antoine Caraccioli to Jean d'Alembert, co-editor of the Encyclopedie.As Director-General of Finance from 1776-1783 Necker controlled all of France's wealth. In February 1781 he published his famous work: Compte rendu au roi the first public accounting of the royal finances of the French monarchy. This, along with his reforming policies, made him many enemies, including Marie Antoinette. The stage was thus set for this "witty and well informed" public attack, in which Necker is made to appear as a kind of magician of politics and finance, capable of "mystifying the whole French nation," and guilty of "suppressions without reimbursements, reforms without profit, loans without limit or measure ... ."As to whether this is the original manuscript or a compositor's copy, we cannot say with certainty. It is neatly written in a beautiful hand on the most expensive paper of the day. We know of only one record of the manuscript, in an 1880 Index to the Catalogue of Additions to the Manuscripts in the British Museum. An historically important manuscript, housed in a handsome drop-spine box. The Life and Trial of F. H. De La Motte, a French Spy for High Treason, At the Sessions-House in the Old Baily, on Saturday the 14th of July 1781, and was hang'd drawn and Quartered at Tyburn, on Friday the 27th Following. T. Truman, in the Strand, 1781. 1st Edition . No Binding. Good. First edition. Scarce. 4.5" x 6.75" , 4-32p. Portrait frontis. ESTC T19880. This is the full account of the trial of Francois Henri de la Motte (d. 1781), who was a french spy and one of the last people to be hung drawn and quartered. He was accused of sending English naval information to France of which he was tried for high treason. Condition: Disbound. Stab holes to the gutter. The lastleaf is partially detached and cropped with slight loss to the page number. Ink marks to the last two leaves. This is a particularly clean copy with just a couple of spots or mark, apart from the last leaf, which is grubby. Description des Alpes Pennines et Rhetiennes? Considérations sur les montagnes volcaniques. Mémoire lu dans une séance de l'académie. de Mannheim le V. Novembre MDCCLXXXI. LAS OBRAS DE XENOFONTE ATENIENSE. Trasladadas de Griego a Castellano por el secretario Diego Gracián. Tomos I y II (obra completa). - En que se ha añadido el texto Griego, y se ha enmendado la Traducción Castellana por el Licenciado Casimiro Florez Canseco, Catedrático de Lengua Griega en los Estudios Reales de Madrid. Tomo I: La Cyripedia o historia de la vida y hechos de Cyro el Mayor. Tomo II: Historia de la entrada de Cyro el Menor en el Asia y de la Retirada de los Diez mil Greigos que fueron con él. Madrid, Imprenta Real de la Gazeta, 1781, 20x26, 2 tomos: I- 2 hojas, XXXVI-549 págs. 1 mapa plegado por Tomás López. II- 2 hojas, XII-435 págs. 1 mapa plegado por Tomás López. Buena encuadernación del XVIII en plena piel con lomeras cuajadas en oro, nervios y tejuelos, el tomo I algo oscurecido por haberse mojado pero en buen estado sólo se aprecia más oscuro, interior muy limpio, sin manchas ni óxido, amplios márgenes, (Palau: copiamos a Menéndez Pelayo: "la edición es bellísima y digna del autor al que se consagraba. El texto griego fue revisado con esmero, y la traducción de Gracián enmendada en todos los lugares mal entendidos por el intérprete. Del docto helenista Canseco son también las notas que ilustran y aclaran las dificultades del original"). (57434). London: Printed for C. Bathurst, J. Buckland, W. Strahan, J. Rivington and Sons [& 32 others in London],, 1781. With critical observations on their works. 4 volumes, octavo (212 x 127 mm). Contemporary green half morocco, red oval labels to smooth spines with alternating gilt urns and urns within foliate frames to compartments, blue paper-backed sides, white string page markers. Engraved portrait frontispiece after Joshua Reynolds to vol. I. Ownership inscription to front free endpaper of vol. I dated 1830, bookplates to pastedowns. Vol. IV without final advertisement leaf, vol. III with terminal blank. Sides rubbed, corners and cover edges worn, occasional light foxing to contents and creasing to page corners, small stain at foot of pp. 337-354 of vol. IV. An excellent set. First authorised separate edition. 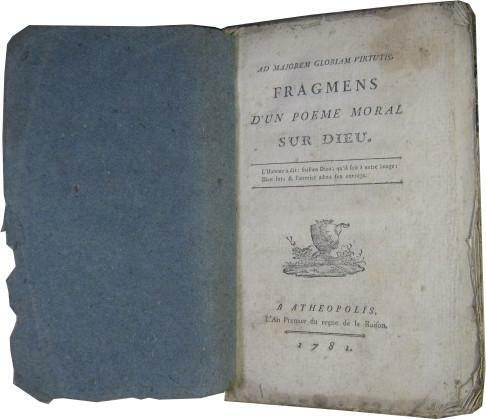 Originally published as prefaces to the long series of collected works of English poetry which Johnson had edited, these essays were here collected and published as a work in their own right, preceded by an unauthorised Dublin edition in 178081. "It was the simplest in style and expression of all his literary labours, the subject appealed to every man of letters in the three kingdoms, and it abounded in anecdote and in criticism" (Courtney and Smith). From the library of the novelist Richard Adams (19202016), best known as the author of the Watership Down (1972), with his bookplate to the pastedown of volume I. Adams used the proceeds of his novels to develop an extensive book collection, including first editions of various Samuel Johnson works. Siciliae populorum et urbium, regum quoque et tyrannorum veteres nummi Saracenorum epocham antecedentes. Typis Regiis, 1781. Tre parti in un volume in folio (cm. 42), pp. vii (1) 103; 20; 15. Con grandi vignette a ciascuno dei tre frontespizi, belle testate con la raffigurazione della Sicilia e 125 tavole incise in rame (così suddivise: 107 + 9 + 9). Solida ed elegante legatura posteriore (1900 ca.) in mezza pelle con punte, dorso a nervi con titoli e ricchi fregi in oro. Testo su 2 colonne; le tavole sono state disegnate e incise da Melchiorre Di Bella. La tavola num. 82 con margini leggermente più ridotti rispetto alle altre e verosimilmente proveniente da un altro esemplare (nonostante possegga esattamente la stessa patina). Etichetta di libreria antiquariua romana applicata alla controguardia. Esemplare complessivemante molto ben conservato. Edizione originale di questa importante opera sulla numismatica siciliana, rara a trovarsi completa delle due appendici. Cfr. Bassoli (Monete e medaglie nel libro antico dal XV al XIX secolo): "Gabriello Castelli, principe di Torremuzza è ancora un benemerito dell'archeologia e della numismatica classica siciliana con una descrizione del proprio museo nel 1767, ma soprattutto con l'eccellente lavoro Siciliae populorum...". Mira (I, p. 197): "Questa è la più ricca ed accurata collezione, che abbiamo, di siciliana numismatica..."; Moncada. Una biblioteca siciliana, 530/1: " Splendida edizione di numismatica siciliana..." . SAINT-NON (JEAN CLAUDE RICHARD DE). Voyage pittoresque ou Description des Royaumes de Naples et de Sicile. 4 Vols in 5. Paris, (Clousier imprimeur), 1781-86. Folio. (51 x 33,5 cm.). Bound to style in 5 uniform full light brown sprinckled full calf (bound in the 1970 ties). Blindtooled lineborders and blindtooled dentelles with blindtooled cornerpieces on covers. 7 raised bands. bands with gilding. Compartments gilt with flowers. Inner hinges in leather. Marbled endpapers. No wear to bindings. 5 halftitles, 5 title-pages with engraved vignette. I: (4),XIII,(3),252 pp. Without an engraved dedication-leaf (called for by Brunet "épitre dédicatoire gravée). II: (4),XXVIII,283 pp. III: (4),XL,201,22 pp. IV: (4),II,(6),XVIII,266 pp. V: (4),(2),267-429,(1) pp., 434 engravings on 317 sheets, including the 14 plates with medals and coins (doubles médailles) + 13 mostly double-page engraved maps, plans and charts. More than 100 larger and smaller vignettes, head-and tailpieces, ornaments etc., 25 in 2 colours. Wide-margined with very few brownspots (a small brownspot on the phallus-plate in volume II), a few leaves with small closed tears in margin, 1 leaf having a printed line repaired (a weakness in the paper) but no loss of letters. Foot of last leaves in volume II with very light foxing. Plates and text fine a clean, gently washed. ¶ First edition of this renowned travelbook, one of the most successful travel books ever published - "the completed work is one of the most beautiful that a private person has ever produced, and it is unparalleled among the sumptuous voyage pittoresque publications". (Millard French,148).In 1759, Claude Richard Saint-Non (1727-1791) was relieved of his duties as a deacon and lawyer, and undertook a cavalier tour through Italy in the years 1759-1761 with the painters Jean-Honoré Fragonard and Hubert Robert. 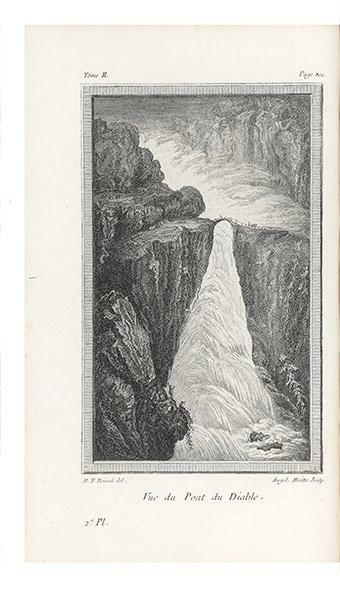 His publication project of a Voyage pittoresque initially envisaged five volumes on the whole of Italy and a volume on Switzerland, but then limited itself to only southern Italy. For the etchings Saint-Non on the one hand on some older pictures by Robert and Fragonard among others. On the other hand, the 61 employed engravers worked mainly on documents which had been supplied by a group of artists traveling on his behalf under the direction of Dominique Vivant Denon, secretary of the French Ambassador in Italy, in 1777/78. Volume I deals with the history, buildings, artists and customs of Naples and Vesuvius with its outbursts. Volume II is dedicated to Herculaneum and Pompeii; Volume III deals with Southern Italy (including Paestum and Capri). Sicily is treated in volumes IV and V. Brunet V,55-56. - Cohen-de Ricci, 928-29. - Ray, French Illustr. Books, 34. 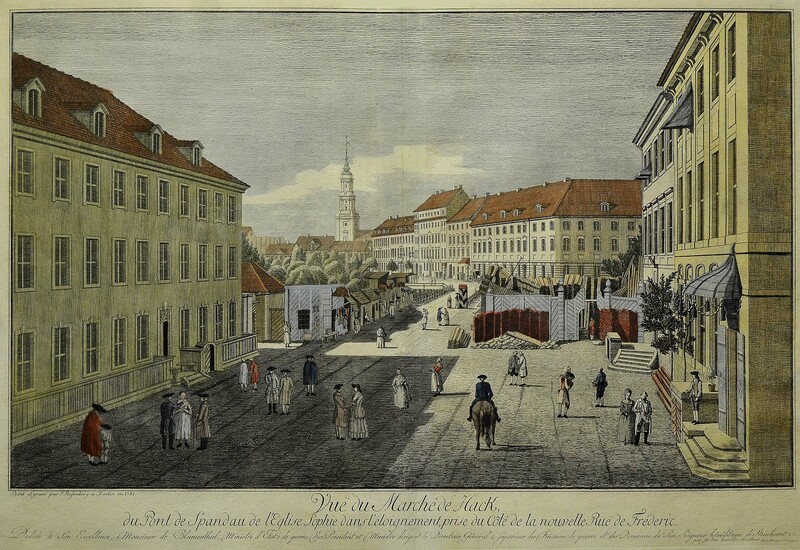 (Frankfurt, Brönner), 1781.. 128 S. Umschlag d. Zt. Wolfstieg 6775; De Backer/Sommervogel V, 330; Nicht bei Goed. 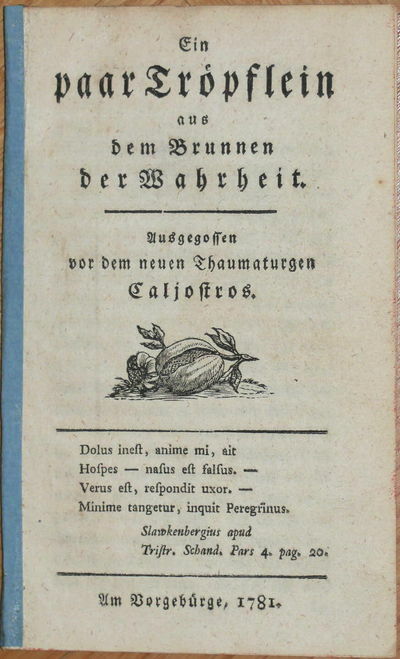 - Erste Ausgabe, einer von drei in der Kollation abweichenden Drucken des Jahres 1781, von Wolfstieg als dritter genannt. Aufsehenerregende Kampfschrift gegen die Rosenkreuzer. Knigge war 1780-84 mit Weishaupt einer der führenden Köpfe der Illuminaten. Ein paar Tröpflein aus dem Brunnen der Wahrheit. Ausgegossen vor dem neuen Thaumaturgen Caljostros. Am Vorgebürge (d. i. Frankfurt, Brönner), 1781.. 46 S., 1 w. Bl. Rückenbroschur- Goed. IV/1, 587, (31), 17; Hayn, Vier neue Curiositätenbibliographien, Cagliostro 98: "Sehr selten! "; Wolfstieg 14362. - Der Autor Bode war Weimarer Hofrat, Freund und Förderer Goethes, den er in Abwesenheit des Meisters vom Stuhl in Loge Anna Amalia in Weimar aufgenommen hatte. Die kritische Schrift über den Hochstapler Cagliostro erzürnte Lavater, einen kritiklosen Bewunderer des sizilianischen Scharlatans. An einen an Goethe gerichteten Brief beschwerte er sich vehement über den für ihn anonymen Verfasser. Der Dichterfürst sah Cagliostro durchaus sehr kritisch, anfänglich gar als Gefahr für Europa, später mehr als Witzfigur, den er literarisch mehrfach verarbeitete (u. a. als "Groß-Cophta"). - Tadelloses Exemplar! - kol. Kupferstich v. J. ( Johann Georg ) Rosenberg b. Morino & Company, dat. 1781, 40 x 66 Ernst, Rosenberg, J.G., Nr. 9; Kiewitz 1052; Rave 6. - 1. Zustand vor der Nummerierung. Mit Verlegeradresse und Dedication. - Der Beobachter steht auf der Straße "An der Spandauer Brücke"/Ecke Neue Friedrichstraße und blickt über den ehemaligen Festungsgraben zum Hackeschen Markt, der den Namen nach dem General Hans Christoph v. Hake erhielt, 1749 Kommandant in Berlin. Im Hintergr. mittig die Sophienkirche. Auf der Spandauer Brücke zahlreiche Baumaterialien, die wohl für den Neubau dieser Brücke verwendet werden sollten ( erfolgte 1785 ). Mittig zeigt die Ansicht die stattlichen Häuser des Hackeschen Marktes, deren größtes das "Kleinsche Haus" war.